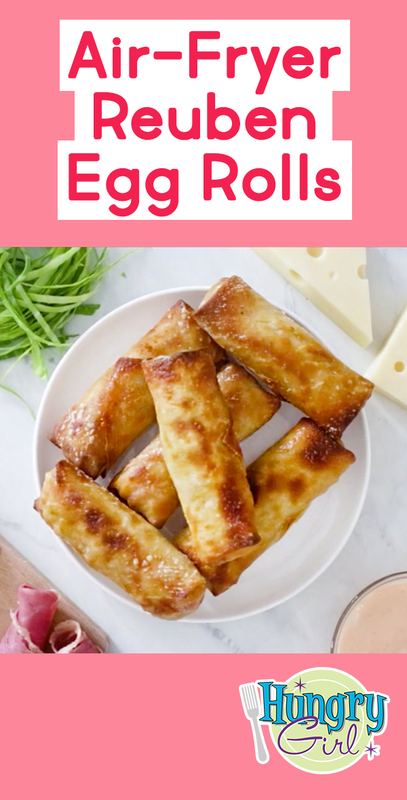 Egg roll wrappers are such a fun recipe ingredient! There are so many creative ways to fill 'em up, and today’s sandwich-inspired recipe calls for just 6 main ingredients. The savory flavor of a classic Reuben sandwich, wrapped in a perfectly crispy coating… Yes! Place coleslaw in a medium microwave-safe bowl, and add 2 tbsp. water. Cover and microwave for 1 1/2 minutes, or until softened. Drain excess liquid or pat dry. Chop corned beef and cheese slices, and add them to the bowl. Add drained sauerkraut and dressing. Mix well. Lay an egg roll wrapper flat on a dry surface. Evenly distribute 1/6th of the mixture (about 1/3 cup) in a row a little below the center. Moisten all four edges by dabbing your fingers in water and going over the edges smoothly. Fold the sides about 3/4 inch toward the middle, to keep mixture from falling out. Roll up the wrapper around the mixture and continue to the top. Seal with a dab of water. Repeat to make 5 more egg rolls. Set air fryer to 392 degrees. Cook for 7 minutes, or until golden brown. Oven Alternative: No air fryer? No problem! Bake at 375 degrees until golden brown, 25 - 30 minutes. Air-Fryer Novice? Check out our guide to all things air fryer! 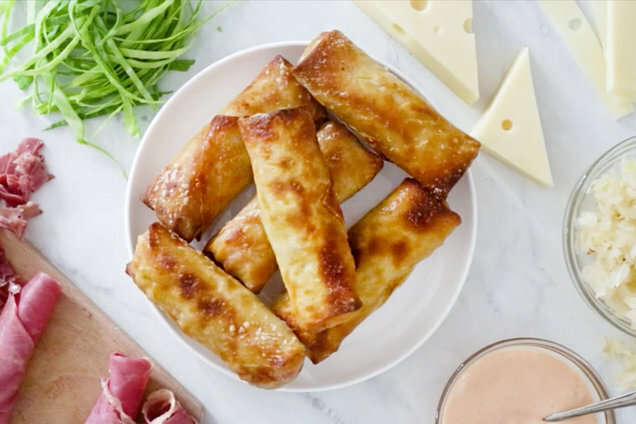 Hungry for More Amazing Air-Fryer Recipes? Today, March 14th, is National Potato Chip Day, so we'd like to give a shout out to our longtime love, Popchips! Be right back… We’re off to scavenge our pantry! Roll 'em on over! Click "Send to a Friend," and share this recipe.